Keurig KOLD Announced | Nerd Much? It’s undeniable that Keurig has changed the coffee game with their revolutionary single serve k-cup coffee maker. After coffee pods were introduced, then came cappuchinos, teas, and all sorts of other hot beverages. 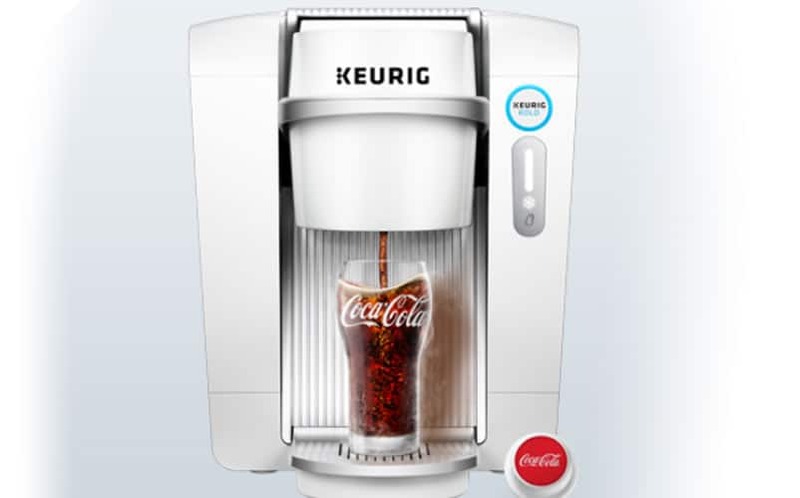 Today, Keurig has announced the Keurig KOLD, which aims to revolutionize the way we consume cold beverages at home. For the first time ever, consumers will be able to actually make their own Coca-Cola, Dr. Pepper, seltzers, ginger ales, craft sodas, sports drinks and other cold beverages right in their own kitchen. Best of all, these drinks are perfectly carbonated without a CO2 cannister, thanks to the patented Karbonator beads. Each cold drink comes in a pod — like the hot kcups — and once water is added, the carbon dioxide is released into the beverages. Each Keurig KOLD delivers a perfect portion size of eight-ounces, with nearly all beverages coming in at less than 100 calories. The device uses an aerospace-inspired thermal transfer system to rapidly cool beverages to the ideal chilled temperature, delivering your drinks at the optimal level of cold. Keurig has announced some of the brands that already have KOLD pods available, including Canada Dry, Coke, Diet Coke, Coke Zero, Sprite, Fanta, and more to come. Keurig also has their own extensive line of cold beverages for your enjoyment, including zero-calorie seltzers, lightly flavored and sweetened waters, craft sodas, and iced teas. The Keurig Kold is available in black or white and comes with two Keurig Kold drink maker glasses for $369.99.